S1nn develops high-tech products in the field of Infotainment, Connectivity and Audio for the automotive industry worldwide. With their company headquarters in Stuttgart, Germany’s automotive capital, and branches located in Ettlingen near Karlsruhe, and in San Diego, California, they address clients and ultra skilled developers worldwide. 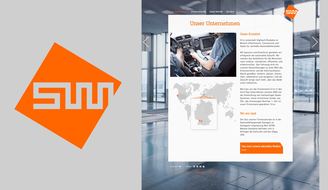 crossland asked us to create a website that can be easily administrated, while at the same time provide a professional mood with relation to the topic “Audio” and “Connectivity”. Our partner designer Sophie Dobrigkeit came up with the idea of waves and lines, and we built the website around this idea. The project was replaced by its newer version in the meantime.